Plain Jane (and no nonsense): Look, Janet, look – Clarks shoes! Look, Janet, look – Clarks shoes! Prompted by previous posts about Clarks shoes, Peter Cross of Auckland recalls being a Clarks guinea-pig. Back in Castle Cary, Somerset, in the early 60s, there were two shoe shops. An upmarket establishment run by Hubert Laver, next door to Parker’s ladies and gentleman’s outfitters, and a downmarket cobbler’s shop run by Les Cleal and his grown-up son. Both have long since gone. As far as I recall the Cleals concentrated on repairs, but sold boots and Tuf shoes on the side, while Mr Laver only sold shoes, mostly Clarks. Clarks produced the sort of footwear that was popular with grownups, and for good reasons. “Clarks” were hard-wearing, comfortable and timeless – in other words, old-fashioned. The sort of shoe sensible middle-class parents would buy for their offspring, and working-class ones if they could afford them. 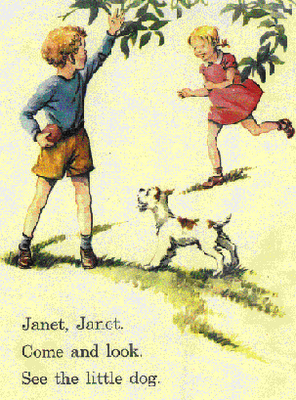 Typical of their range was their T-bar sandal, the sort of footwear worn by Janet and John in those dreadful early readers, and by kids depicted in Ladybird books, where earnest boys and girls explored a rock pool or something equally worthy. For a time Clarks made a feature of measuring the width of your foot as well as its length, and their products came in widths ABCD. So if, as in my case, one foot was slightly wider than the other, you could get a size 3C left and a 3D right. This innovation was much publicised at the time but was probably quietly dropped as the commercial implications became clear. I’ve never seen anything like it since. My old mum, never one to hoard things, had possession of her grandmother’s wedding shoes. They’d only been worn once and were still in the box. I guess they would have been made in the 1880s and remarkably they didn’t even have a left or right foot but two identical ones. Clarks had a shoe museum in Street and she loaned them to the firm, and, as far as I’m aware, they must still be there somewhere. In a sense Clarks dominated the local landscape in that their Glastonbury Tor trade mark was visible from the town, and their headquarters and main factory was in Street, a dozen miles away. And between the mid-50s and the early 90s, a satellite factory manufactured insoles in Cary itself, employing 200 people at one stage. The only footwear that interested me and most boys then was football boots. Kids would spend all year talking about the sort of boot they anticipated getting as their main Christmas present. A continental boot (more a shoe really), made with soft black leather without a toecap and perhaps a flash of colour, was talked about a lot. There would be a brief honeymoon period when the new boots would be admired and cherished by their owner, before he started to covert another model; perhaps ones with removable studs. Although indifferent to shoes, I’m sure I wasn’t the only boy to feel pissed off when Clarks started using some of the girls at our school as guinea pigs for their new products. It was overseen by Marion “Fanny” Felix who taught needlework and was also deputy head. Every so often a guy from the factory would arrive at school and fit out volunteers with various shoes. While still at the sensible end of the spectrum, these shoes could occasionally be more daring than a schoolgirl was supposed to wear. This guy would return from time to check on the shoes and there was a threat that some would be taken back to a lab and never returned, but in reality mostly they were given back for keeps. Then one day it was announced that Clarks would be bringing along boys shoes, and I got my one and only pair. Brown suede they were, and for a day or two my pride and joy. Within a week, however, the sole had started to distance itself from the upper: no doubt protesting against playground football. Apart from experimenting with new designs, they also tested new components, in this case glue. And so like everyone else I wandered around in them until they broke up and I went back to shoes made by a competitor, no doubt with a reputation for making a less durable product. Despite Clark's size, it remains a private company, with 81% shares owned by members of the family and the rest by employees. They are also a Quaker company and like others, for instance, the big chocolate families Cadbury’s, Rowntree and Fry’s, were model employers and philanthropists. My parents were members of three public libraries and got through a dozen books a week between them, but their favourite library by a long shot was the one in Street, which had been paid for by the company. The public swimming pool in Street, a huge outdoor job, head and shoulders better than the rest, was another donation. The company owned houses they built and rented to their staff. On the downside, for many years Street was a dry town, so residents had to go to one of the outlying villages to get a drink. And I recall hearing that the husband of a woman I knew called Christine Pitts lost his job at Clarks when the couple got divorced. Mind you, everyone in the manufacturing side of the business has lost their jobs in England now. The factory in Castle Cary closed in 1992, and well before this, production had begun to move overseas. The family continues to prosper, making a profit on sales of 125 million pounds in 2010, but the shoes are now made, according to the same entry in Wikipedia, in India, Cambodia, China, Brazil and Vietnam. Charity may have started at home but it hasn’t stayed there. 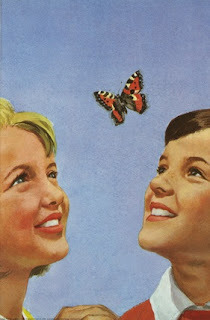 We girls eagerly awaited our name being called to get a pair of wear test shoes, most were quite nice I recall and those that were ghastly - I remember some black lace ups with VERY rounded toes - Mrs Felix allowed us to tart up with ribbons and we had great fun with them, putting different ribbons in to “change the look”. It was indeed very sad if they didn’t come back after the wear testing. I remember one time going to the factory for an afternoon with three other kids, me being the oldest. We went to the Shepton Mallet factory and were shown around and given tea in the works canteen, along with trying on loads of shoes and having our feet fiddled around with. Going to be fitted with the wear tests also meant skipping off lessons for about 15 minutes, it made a boring double period move along nicely! I still am a fan of Clarks shoes! Pete has a golfing mate who travels all over the world training shop assistants to measure feet properly, this must cost Clarks an awful lot of money and I have wondered why it is necessary for him to travel around doing this, wouldn’t it be just as easy to produce a manual to show how it is done, it can’t be that difficult surely? At age 16 I went to work in Strode Components in Castle Cary, the subsidiary making the insoles etc for the shoes. Meeting up with some old school friends who worked there and making other friends. The work to begin with was awful, I was office junior and had the grotty jobs, running errands and photocopying. When I left aged 21 on my marriage I was working in the buying office doing ledger work and typing letters etc for the buyer. I remember a huge lot of laughs. The 8am start was a bit awful especially in winter. I often visit “Clarks Village” outlet centre and I like it there very much, it has a very “villagey” feel and I think it is very tastefully laid out. There is also the wonderful feeling of buying brand names at a reduced price, how wonderful is a bargain? We went only last week to get some Merrill walking boots at half price, for Pete, he hates shopping but he was dead chuffed with his purchase even so. I have been to other outlet shopping centres and I think this is one of the nicest. I really enjoy browsing the Clarks outlet shop, they often have a buy one pair, get another half price deal on, sheer bliss! In a sense clarks shoes outlet dominated the local landscape in that their Glastonbury Tor trade mark was visible from the town, and their headquarters and main factory was in Street, a dozen miles away. And between the mid-50s and the early 90s, a satellite factory manufactured insoles in Cary itself, employing 200 people at one stage.